Traditional media is not dead. Do not underestimate it. We are living in an era where content is distributed via multiple channels. A 360-degree media monitoring – all in real-time, is the fastest way not only to receive useful feedback directly from your customers but also to predict and prevent all possible issues. To put it short, most companies are focused either on online or social media monitoring. But can we get the full picture, can we understand the market and our customers if we don’t take traditional media into account? There are many who are saying that the future of traditional media looks grimm, and are even going as far as to predict its imposing death. But in the era of the fake news, it looks like they are not dead at all. No doubt, the online channels are easily accessible and still the most used for sharing content. But after 2016, data-privacy scandals like the Brexit, US elections, as well as Cambridge analytica scandal, fully destroyed their renommée. 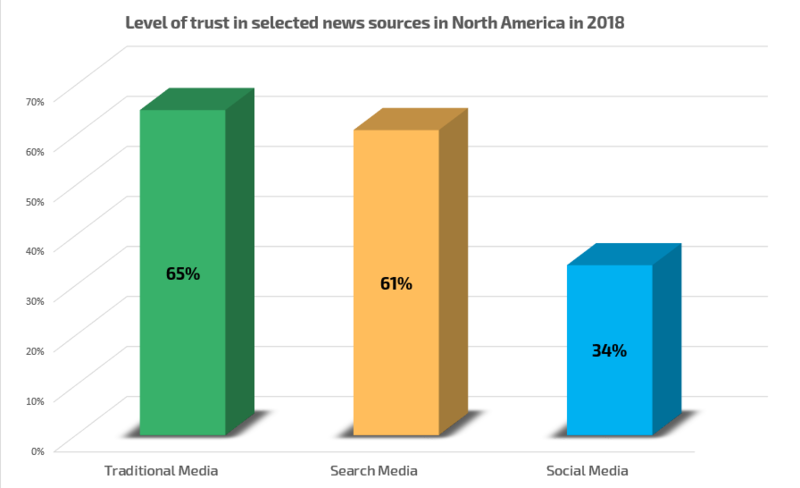 Meanwhile, research about the level of trust in selected media sources show that only 34% of respondents in North Amerika trust the news provided by Social media channels. Traditional media is still the most trustworthy by 65%. Why are TV, radio and print still considered as the most reliable sources of information? There is always a body behind reporters and editors that has access to credible sources of information. The data is usually double checked. There are many local regulations, and it ’s also very expensive to create a fake television, radio station or newspaper. The publishers and media companies started shifting their models towards higher quality content and putting more emphasis on the pay-per-read system. Watching remains the preferred type of news consumption. People like to watch – is easier, it’s time-saving and it’s entertaining. Social and online media are a breeding ground for news generated by users, but traditional media is still playing a huge role in public opinion formation. If you are responsible for the business strategy, marketing or public relations of a mid-sized or big company, save time and money by using media monitoring tool, but don’t underestimate traditional media.